Even though I’m usually a shower person, there is nothing better than beautifully scented bath and a long stretch of unencumbered time. I love using essential oils in the bath. And…i use them regularly like this for my daughter. Her takes a detox bath 2-3x per week with oils & epsom salt to support toxin elimination. But…Oil and water don’t mix. And heat causes essential oils to evaporate quickly. So what’s a mum to do? USE A CARRIER: I add 4-6 drops of essential oils to the epsom salts before adding the whole thing to the bath. I do this last…just before my daughter gets into the bath to minimise evaporation. You can use other carriers too: fractionated coconut oil, jojoba oil, milk…whatever you prefer. LESS IS MORE: In the warm water, your skin absorbs the oil quickly. Don’t over load your bath with essential oil. 3-6 drops is usually plenty. TAKE TIME: When using epsom salts, you need to soak about 20 minutes to get the full detoxification and muscle-relaxing benefits. 2 drops lavender, 2 drops zendocrine, 4 drops wild orange. There are so many possibilities. What combinations do you like? For help finding the right combination of oils to support you and for help buying doTERRA Oils, contact me! 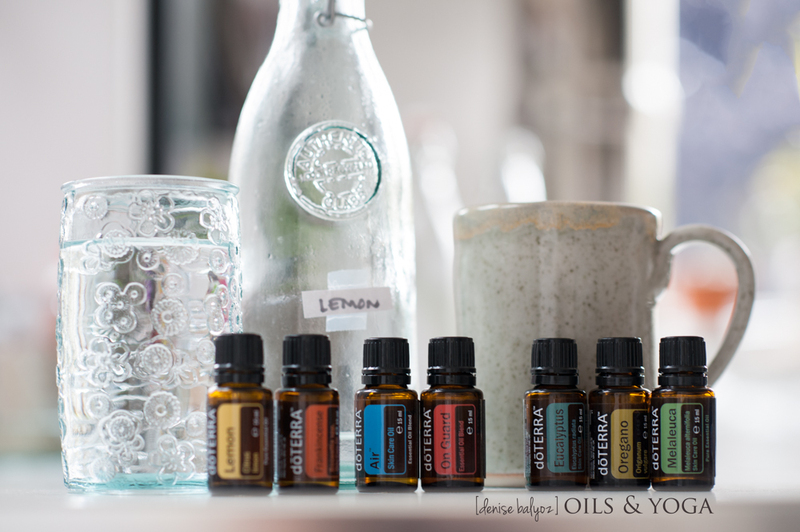 HYDRATE: Water with doTERRA lemon essential oil — I like to add 1-2 drops into a large glass (not plastic!) of water several times a day. This feels good on my throat and helps support a gentle detox. Plus, the flavour encourages me to drink more. The immune system functions best when you stay super hydrated. DIFFUSE germ-fighting oils: Whenever I’m feeling even a little under the weather, On Guard blend is on repeat in the diffuser. I like Onguard + Wild Orange + Siberian Fir (oh the house smells like Christmas!) Alternatively, you can try Rosemary + Eucalyptus + Clove + Wild Orange. Either of these combos help to fight airborne bacteria. INTERNALLY: On Guard Soft Gels — Oh how I love these little soft gels. They contain the On Guard oil blend with black pepper, oregano & melissa essential oil. Together this combination is a power house for boosting the immune system. I take 1-2 per day when needed. INTERNALLY: I also like to take 1 drop of frankincense & 1 drop of copaiba under my tongue or in a veggie capsule as part of my daily maintenance. These oils are very healing and help to fight inflammation. When I’m feeling iffy I take this combo 2x per day. Otherwise, I do this 1x per day as maintenance. TOPICALLY: The Super Greens: Eucalyptus, Oregano & Melaleuca. When I’m under the weather, how I love these oils. They are anti-inflammatory, antiseptic, help to fight of viruses and bacteria and support the immune system. I massage a drop or two onto the soles of my feet with fractionated coconut oil a few times per day when my body needs the help. Note: Oregano is what is known as a hot oil. Always dilute with several drops of FCO before rubbing into the skin. THE POWER SHOWER: Add 1 drop of Eucalyptus to your shower or bath and let the steam surround you. This is amazing for the airways and turns your shower into a spa….and it will help to clear congestion. Alternatively, you can try Air (aka Breathe in the USA). simultaneously soothing and a congestion buster. SUPPORT THE GUT: Our immune system starts in the gut and when things are off-kilter, we need to feed it. I take PB Assist morning & night when I’m fighting off germs. I continue to do this for a week or two once I feel well again. PB Assist+ is a proprietary formula of pre-biotic fiber and six strains of probiotic microorganisms in a unique double-layer vegetable capsule. It delivers 6 billion CFUs of active probiotic cultures and soluble pre-biotic FOS (fructooligosaccharides) that encourage friendly bacterial growth. I love that the double layer delivery system protects the probiotic from the stomach acid to that it can arrive in the gut where it is needed. Learn more here. WHOLE FOOD NUTRITION: I take the Life Long Vitality supplements daily…but sometimes when I’m busy I might forget a dose or two. When I’m sick, I make sure I don’t forget! These supplements give my body the nutrition it needs to recover fast. This pack of supplements contains all of the vitamins, minerals, polyphenols, antioxidants, omegas & fatty acids that my body needs. They also contain essential oils. Learn more here In addition, I simplify my diet, removing fats, caffeine & sugar, adding vegetables prepared simply. SLEEP: Ironically, when I’m ill, I usually sleep poorly. Sleep-time is when the body heals and renews itself. I use Serenity blend or Lavender in the diffuser to help me rest. I also apply a drop to my wrists and to the soles of my feet. If I wake, I reapply the oil and usually drift off again without much fuss. MOVE: Do I do my full practice if I’m sick? No…My body needs the energy to fight germs and recalibrate. However, I do sit in meditation for 5-15 minutes at least once daily. And then I move slowly through a sun salutation or two. If my energy feels good, I will continue to move through the practice but stop when my body gets tired. I find that ujjayi breath helps to clear congestion. Physical movement supports lymphatic circulation and my muscles always feel better for a short time on the mat. Breathe + Frankincense are my go-to oils for this. Breathe for my airways and frankincense for its meditative support. I hope all of this is helpful. If you would like to try doTERRA oils, I would love to help you find the right oils for you. Please contact me with any questions or for help. Wishing you a healthy germ-free season! Note: doTERRA oils are Certified Pure Therapeutic Grade oils. This is why they CAN safely be taken internally. You've heard the quote: 'Practice and all is coming.' It turns out that this is true. ALL is coming...the good, the bad...and for me, the knee pain. To have chronic knee pain was a surprise for me. You see, I've been practicing yoga for a long, long time. I first started 2 decades ago. For the last 5 years, I've maintained a daily Ashtanga home practice of full Primary and now Primary & Intermediate. Never before have I had knee issues. My knees have no prior sport-related injuries. I'm particular about checking my alignment to protect my knees. I don't wear heels very often. So...My knees were fine. Until they weren't. As crazy as it sounds, what a gift this pain has been for my practice...but I'm jumping ahead of this story. My knee pain started rather suddenly. First in one, and then in both knees. I couldn't point to one particular posture or any injury that caused it. It just appeared. It would seem to get better and then it would get worse. I only see my teacher intermittently at workshops so I didn't have anyone to ask. So what did I do? 1. Slow way, WAY down. Listen & then, modify. My practice became an exercise of slow movement and constant attention to the tiniest whisper of discomfort. I added breaths...lots of breaths...to many asanas. If anything felt the least bit uncomfortable, I stopped. If I could relax the muscles and then proceed without pain, I would. If not, I would modify the shape of the asana. I practiced what I could WHILE remaining pain-free. For a time, Ardha Baddha Padmottanasana (Half Bound Lotus Forward Bend) became Tree pose or a Balancing Figure 4 Hip stretch (see photo). Janu Sirsasana C was not possible for a few weeks. In fact, neither was Janu A or B or Tirangmukhaikapada Paschimattanasana or Padmasana...and least not until I implemented the next suggestions. 2. Keep the thigh bone in hip socket. By slowing down and paying very close attention to the subtlety of my body, I noticed that I was pulling my right thigh bone out of the hip socket in many of the postures. By visualising the bone and socket joint, I imagined pulling the bone deeper into the socket instead of pushing it out. If I did this, I found that I triggered a tiny muscular engagement in my hip that eased some of the knee pain. This muscular engagement also helped to deepen my engagement of Mula Bandha. Brilliant! But this wasn't the complete answer. These two adjustments, used in combination, worked for a while, but then the knee pain started to return though not to its original intensity. 4. Bandhas and more bandhas. By again slowing down and paying attention, I noticed that I could relieve knee pain by engaging my bandhas. In fact, any knee pain was a sign that I was not using my bandhas as deeply as I could. Bandha engagement helped to lift the weight of my torso out of my hip and knee, freeing it to move without pain. particularly in any forward bends. 5. Soft ball rolling. No matter how pain free my practice might be, my knees would often tighten up throughout the day. I now keep 2 soft squash balls under my desk. I roll my feet over these balls several times a day and this helps to release muscular tension in my knees, legs and hips. Though golf balls are the same size, I found them to be too hard and harsh on my foot. There is something about the softness of the squash balls that works miracles. And 6. (I know...I promised 5! You get an extra bonus tip! :) ) LOTS of hip stretching. This sort of ties into the soft ball rolling. The more I stretched my hips and rolled my feet, the happier my knees seem to be. So why did I have knee pain? And why now? The honest answer is that I don't really know. I do have a theory. I suspect my work in Intermediate has something to do with it. NOT because I'm mis-practicing the postures during my practice, but because I need more internal connection and strength to progress in them. My patterning issues (I have a slight scoliosis and so am lopsided...as we all are in one way or another...) could no longer be left unaddressed. My knee pain has made me aware of how I engage and use my shoulder girdle, my bandhas and how I need to adjust for the scoliosis. I've learned a LOT in these last 3 months. And I feel stronger and lighter in my practice as a result. So yes, practice and all is coming. My knee pain was the best thing that happened to my practice. Please note: I am not a doctor or a physical therapist. This article is for informational purposes only and is not intended to serve as a substitute for the consultation, diagnosis, and/or medical treatment of a qualified physician or healthcare provider. For a moment, think of water in all of its forms and functions: At once it can be soft and hard. Life-giving and a force of the greatest destruction. It moulds itself easily and without complaint to its container. And simply with its presence, it can cheer even the most intractable child. How perfect on this day when we have both the Summer Solstice and the full moon (an occurrence that happens about once every 70 years or so...). In yoga, the sun represents something fiery, bright and hot with a masculine energy. The moon is cool, reflective, calm and represents the female energy. We are often too much one or the other. In our practice, we strive for balance between the two energies. We must flow (like water) between the two to find our equilibrium. On this day of the summer solstice and the full moon, we are invited to release the old and embrace the new. We are invited to set our intentions and plant seeds for the next 6 months. And so, a practice embodying the fluidity of water helps us to find what it is that we want & need. It welcomes us to add flexibility to places that feel tight and stuck and it invites us to contain those areas that are too unstructured and without support. let your voice be quiet. of the air moving your lungs. moving until the very air feels twisted around you. for you to grow again. Strength and Grace is the theme in class these week. Children embody this naturally. How can we find this in our practice?